Game development is one of the lucrative professions right now. And if you are starting to learn game development, your best bet is to use free game engines. Game Engines simplify the game development process, and enable you to take care of core game implementation rather than reinvent the wheel. Game engines provide development tools that can be used by programmers to simplify their work. In short, game engines provide the tools and functionality to develop a game. In this article we will cover the ten most popular, free game engines. 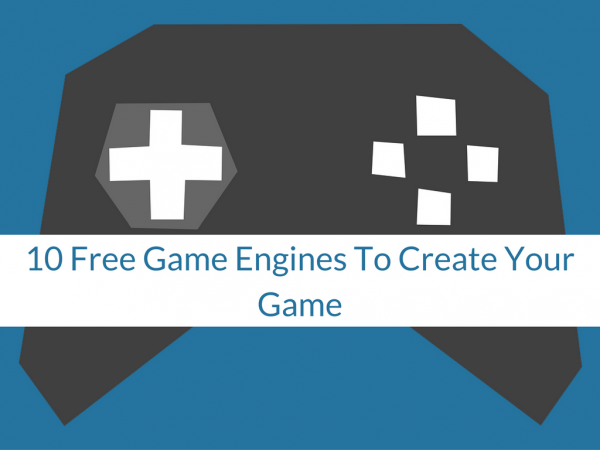 These game engines will let you create your own game! Without further ado, let’s get started with the ten free game engines. Unity is considered one of the best game engines in the industry. The personal version is free, and can be used to create 2D and 3D games. It covers 24 platforms ranging from mobile, virtual reality, desktop, console, web, and TV platforms. The most prominent titles made in Unity are Temple Run; Deus Ex: The Fall; and Assassin’s Creed: Identity. Unity is not only used by the big companies with big budgets, but indie game developers like Juoni, from Orlando, are building games like Chaos Complex. With nine years of experience, Juoni is making a live action RPG game, providing enough evidence that Unity can be used for indie game development. Unreal Engine 4 is one of the advanced suites for game development. It is available for free, but you have to pay “a 5% royalty on games and applications you release,” and that, too, only when your revenue hits the first $3000 mark. According to its website, you pay “no royalty for film projects, contracting and consulting projects such as architecture, simulation and visualization.” Final Fantasy VII Remake–a remake of the popular Final Fantasy VII released back in 1997, and Tekken 7 are built using Unreal Engine 4. You can also make games in Unreal Engine 4 just like Keyle is making his 3D racing game using Unreal Engine 4. As you can see, the possibilities are endless! Phaser is an open source HTML5 game engine that lately has been building a lot of hype. It is well-maintained by Richard Davey and the community surrounding it. Phaser is particularly designed for games based on desktop and mobile web browsers. It is an excellent option for anyone who wants to build web games. ChennyBaBy, who is developing one of the most iconic games, the snake game, is also using Phaser. The game developer is from the UK. Click here to watch him develop the game in real time. CryEngine is one of the most popular game engines out there, evidenced by the number of “big games” using it such as Giant, Sniper II: Ghost Warrior, and Cabal II. It caught the attention of the game developers and consumers when Crysis was released. Crysis introduced new levels of graphics-fidelity thanks to CryEngine. Later on, multiple versions of CryEngine were released to support the new features and functionalities. Recently, due to many game engines going free, CryEngine’s owners decided to move to the “Pay What You Want” model. What this means is, you pay what you think is justified, with the possibility of getting the engine for free. It has titles such as Far Cry, Crysis, and Ryse: Son of Rome. HTML5 game engines are popular among the game developers. One such game engine, Turblenz, offers an open source platform for game developers. It offers all the core features that a game developer needs to develop, integrate, and monetize a game app. Furthermore, there is no limit on how you use it, as it is available under MIT license. There are some incredible games that you can develop using Turblenz. Check out the games here. Up to this point, we covered game engines that focuses on you providing minute control over game development. But what about game engines that can let you develop a game without writing a single line of code? Construct 2 lets you do just that. With Construct 2, you can start building games for free. But if you want to take full advantage, you need to get the business edition. Watch Shimo struggle his way through developing a game using Construct 2. Corona SDK provides the tools to build cross-platform games. Right Now, the API only lets you create 2D games, but it also helps you create sophisticated features using Lua-based APIs. If you are working on a cross-platform project, it can easily give you the edge. Furthermore, you can monetize Corona SDK using Corona Ads. Developing using Corona is a piece of cake, thanks to real-time testing and easy learning curve. Landoncope, a game developer from Salt Lake City, UT, in the United States, is working on mobile kids games using Corona. Check him out here! GameSalad is yet another way to get started with game development, with minimal or no coding. It is easy to use, and anyone can create a game from scratch. Another advantage of using GameSalad is the fact that it lets you publish the game to all the well-known platforms including Windows, Android, iOS, etc. Plus, the game creator is available for both Mac and Windows. Lumberyard is a new game engine released by Amazon to help developers take advantage of their infrastructure. Amazon is not only an eCommerce company, but a technology company. With Lumberyard, both indie game developers and AAA studios can take advantage of the tool. Moreover, Lumberyard is open source, and there is no direct or indirect fees associated with using the game engine. libGDX engine is a popular game engine that helps anyone to develop an amazing game. It utilizes Java and offers multi-platform support for game publishing. Games such as Ingress, the spiritual predecessor of Pokémon GO, is also developed using libGDX engine. With libGDX you can do cross-platform development. Community support is also superb, and you can get an excellent documentation to work with. A must-try if you are starting out with game development. Getting started with game development is easy with all the free game engines. 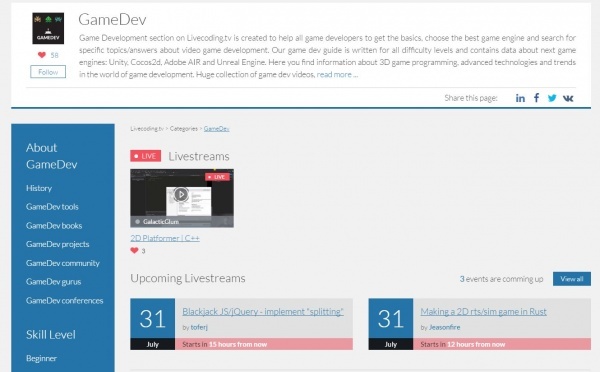 Livecoding has also released a special place for you to browse all their game development content. Check out the gamedev page here. You can also check out the GamDev language category page for gamedev-related content, including gamedev broadcasts, history of gamedev, gamedev books, and much more. So, which game engine will you pick for your next project? Comment below and let us know. Also, we know we missed a lot because it is not possible to list all the great free game engines available. So let us also know which game engine you think is amazing.